Here at DaRa Switchboards, we’re always looking for ways to improve efficiency and quality at our manufacturing facility. We pride ourselves on our ability to deliver custom switchboard solutions, but there’s always room for improvement along the manufacturing chain. To help achieve the level of optimisation we are aiming for, DaRa has partnered with Bossard, a market leader in fastening technology. Their Smart Factory Logistics solution ensures our engineers have the parts and equipment they need to manufacture an electrical switchboard when our customers need it. DaRa’s manufacturing facility just became a lot smarter. What has changed at DaRa’s facility? While we have always endeavoured to deliver on projects for our clients as quickly as possible, previously we worked on a strategy of ordering components for our switchboards as required. An order would come in from a customer, we would design the solution and bring in the necessary parts on a project-to-project basis. With the new manufacturing facility, however, in the interest of greater efficiency DaRa opted for the new Smart Factory Logistics system from Bossard. The components required to manufacture standard panel boards, group meter panels, tee off boxes and pillars are supplied to the production line through the new system, effectively removing the waiting time for parts to manufacture. 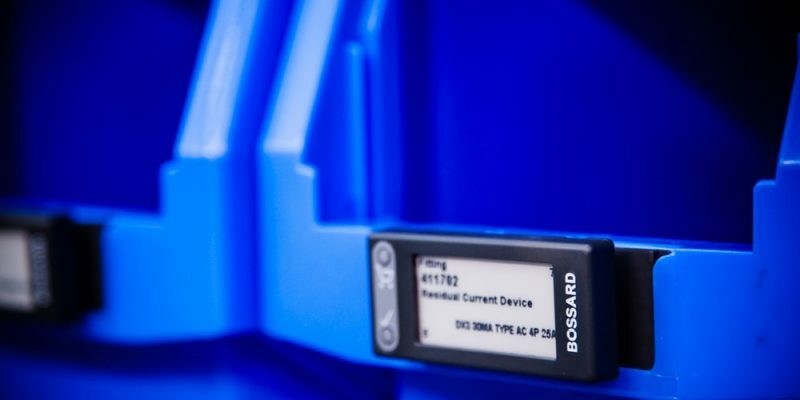 Tapping into sophisticated internet of things technology, Bossard’s Smart Bins feature integrated weight sensors, monitoring stock levels and demand in real-time. When the supply of components gets low, Bossard automatically ships new stock to our facility, ensuring we’re never caught without the parts we need to deliver to clients. Bossard’s Smart Factory Logistics system removes the waiting time for parts to manufacture. How does this impact our clients? As you might expect, having an automated system to supply our production team has a huge impact on DaRa’s productivity. The custom switchboard manufacturing process is far more efficient and streamlined, and the time savings can be passed on to our customers in terms of affordability. We’re also much more capable of responding to customer queries and requests faster. Depending on the level of customisation a client requires, DaRa’s production team can deliver high quality, Australian-built switchboard solutions of all shapes and sizes without delay. We have always strived to create the best custom switchboards possible for our clients, and our new integration with Bossard’s Smart Factory Logistics solution allows us to do that faster than ever before. Get in touch with DaRa, and ensure you receive your next electrical switchboard as soon as you need it.